Phelan M. Ebenhack / AP. 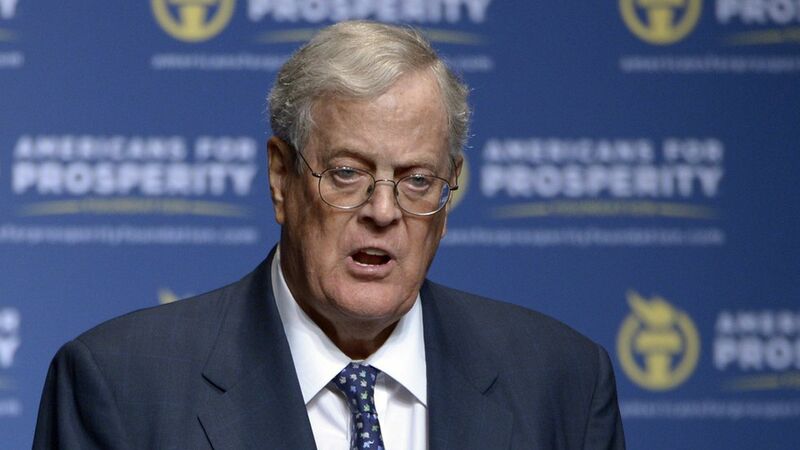 The Koch donor network, helmed by billionaire brothers Charles and David Koch, is poised to join the fray on President Trump's behalf. At their retreat in Indian Wells, Calif., top Koch officials said they're waiting for the nominee's identity to be revealed, but they liked the initial list of names Trump released. Why this matters: The Kochs have the biggest political infrastructure and the most cash of any outside group on the right, and they want to be helpful to Trump where they align with his policies, including on regulatory reform, tax cuts, and now, SCOTUS. Charles Koch, 81, has made it abundantly clear to donors and officials that he's not going anywhere. What's next: Majority Leader Mitch McConnell wants to get Trump's nominee through the traditional way: Marshaling 60 votes in the Senate. He'd rather not break precedent and use the so-called "nuclear option" for the highest court (ramming the nominee through with 51 votes.) To do that, Republicans need to pressure eight Democrats into supporting the nominee. Outside groups matter in this battle: The Judicial Crisis Network "will lead a $10 million effort encouraging 10 Senate Dems up for re-elect in 2018 to vote to confirm nominee or face losing their seats in 2018," says conservative operative Greg Mueller.